Recently, the United States District Courts for the Middle District of Pennsylvania and the District of New Jersey almost simultaneously granted a consortium of natural gas companies the right of eminent domain to take steps towards building a pipeline connecting natural gas sources in Pennsylvania to parts of New Jersey. The opinions, which were released within three days of one another, involved challenges by local residents, environmental groups, and governmental agencies who argued that because certificates of approval had not yet been issued by the Federal Energy Regulatory Commission (FERC), PennEast Pipeline Company, the energy consortium involved in building the pipeline, should not be able to seize any private land. 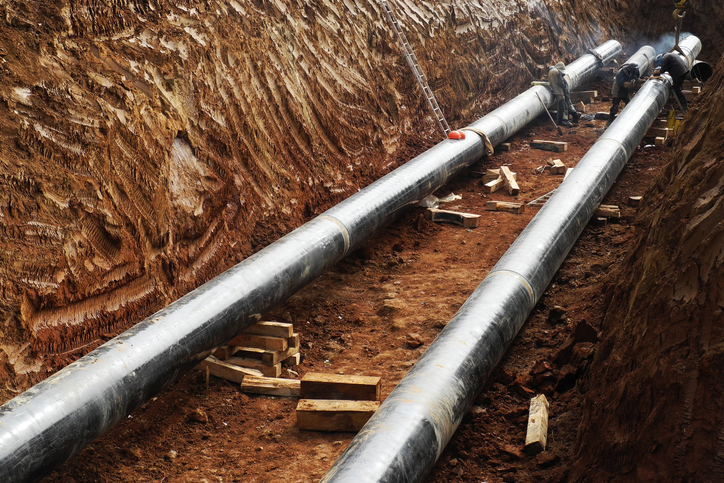 Under the Natural Gas Act (NGA), the holder of a certificate of public convenience and necessity issued by the FERC is permitted to use eminent domain to acquire rights of way necessary to construct, operate, and maintain a project, as approved by an FERC order. 15 U.S.C. §717f(h). Pursuant to the federal statute, eminent domain can only be exercised if the party seeking to exercise it has acquired that FERC certificate, among other conditions. Landowners argued that this condition had not been met, and therefore any type of seizure of the property at issue was improper and untimely. Both federal courts disagreed with the landowners’ arguments. In the Pennsylvania case, PennEast Pipeline Co. v. Susana Bullrich, et. al., the court stated that there is no requirement in either the FERC or the NGA that a holder of the certificate must meet all of its conditions before actually taking possession of a property. The court stated that, if the FERC certification requirement was interpreted as the opposition wanted, no entry on a private property could take place before all pre-conditions were met; however, that would be an impossible standard as many of the pre-conditions cannot be met without access to the property in the first place. The court classified the arguments “contorted reasoning” and would make the FERC certificate “nothing more than a meaningless piece of paper.” Bullrich at 11. In the companion case in New Jersey, In Re PennEast Pipeline Company, LLC, the opposition to the pipeline argued, among other things, that the NGA does not permit a private company to take land by eminent domain. However, the court rejected that argument and instead concluded that the NGA does not address that situation because the law allows any holder of a certificate of public convenience from the FERC to acquire rights of way by the exercise of eminent domain through the court system, regardless of whether it is a private company or some other entity. Eminent domain is a two-part process in Pennsylvania, comprised firstly of a land survey and environmental assessment, followed by a second phase involving condemnation of the land and providing the owner fair compensation. The District Court’s ruling in Pennsylvania enables the energy consortium to conduct the first step involving land surveys and environmental assessments on property whose owners have resisted granting access. Conversely, New Jersey’s eminent domain law combines survey and assessment access with condemnation and compensation into one single step. The 120-mile long, 36-inch underground pipeline has an estimated coast of nearly $1 billion and would carry natural gas obtained via hydraulic fracturing in the Marcellus Shale geologic formation in northeastern Pennsylvania, into central New Jersey. The pipeline is intended to provide energy for domestic heating and electricity to communities in both states, as well as New York. Although these two recent rulings are favorable to the gas industry, there are still multiple steps to be completed before construction could begin, including further permitting from the New Jersey Department of Environmental Protection and from the Delaware River Basin Commission.